In days of old when Knights were bold and as susceptible to temptation and stupidity as the rest of us. Set one hundred years after the Norman conquest of England, we have an occupied country ruled by Normans. King Richard is in prison and his brother Prince John is ruling for his own ends. Wilfred of Ivanhoe is the son of a Saxon Lord but is out of favour with his father because he's been off at the Crusades with the Norman King Richard The Lion Heart, who as mentioned is a prisoner off shore. We have a Friar Tuck, a Locksley who splits the arrow with one of his own at the games-Locksley of course invents as Robin of Sherwood toward the end. The book itself is more about Issac the Jew and his daughter Rebecca, these two are the main catalysts for events. religion plays a large part in the story, the astounding ignorance shown by believers is staggering and these are the same problems that plague us today. There are lots of minor characters,Wamba the Jester, Gurth the Swineherd and many Knights Templar who all add a lot to this tale. 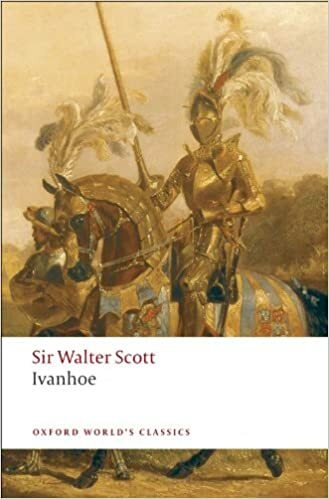 The book is 600 odd pages and does drag a bit in the middle where Scott gets a bit verbose and tries to put too much history into the yarn, history which evidently is debatable as to whether its true or not, but is finishes well and is genuinely exciting. It s a great wee adventure story and not a children's book by any stretch, even if it was I'd have still read it. This is one of those book that we had at school in abridged form when I was 8 or 9, very glad to have read the entire thing.